Huayna Picchu is the towering mountain behind the actual site of Machu Picchu. From a distance the mountain looks impossible to climb without the necessary tools but even though a strenuous climb with some parts where you will actually will need both hands and feet, the climb is quite possible for all averagely fit visitors. 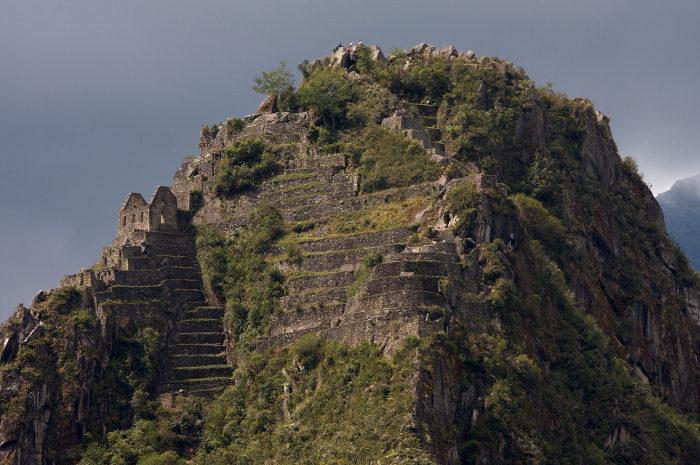 For many people climbing Huayna Picchu is one of the highlights when visiting Machu Picchu. The climb itself is interesting as you will see how the Inca did cut out some steps out of the rocks and as you wind around the side of a mountain will see Machu Picchu from different angles. Before you reach the top you will also have to go through a tunnel carved in the rocks and the higher you get the more structures you will recognize on the top of the mountain. Some structures and terraces are built on impossible places that really speak to your imagination. Some structures are almost glued to the mountain side with a sheer drop of a couple of hundred meters on the other side. The views (on a clear day – on cloudy days sometimes you cannot even see the site from here) of Machu Picchu seen from Huayna Picchu are breathtaking and do really give you an impression of the magnitude of the site. You will also be able to appreciate the different sectors of the site as the surrounding landscapes with some snowcapped mountains. A couple of years ago, the INC (Peru’s National Cultural Institute) decided to implement a maximum number of visitors daily to climb the Huayna Picchu Mountain. This was done to diminish the impact of visitors on this steep climb and to allow the excavations on the top of the mountain its space. The number implemented was 400 visitors daily. The visitors could go up between the times the site opens until 2 hours before the site closes in the evening. From the 25th of July on, the INC together with the changes for the entrance tickets to Machu Picchu changed the rules to climb Huayna Picchu. The maximum number of 400 people daily has been maintained but the big change is the fact that visitors can only climb Huayna Picchu in the morning in two groups of 200 each. The groups have been given fixed times to climb Huayna Picchu and the time allowed on the mountain therefore has also been limited. The first group can climb Huayna Picchu from 7-8AM and the second group from 10-11AM. This also means that the people from the first group have to back down by 10AM. For the second group this would be 1PM. These new rules and especially the time slots in place, many people (especially the ones who have a one day visit to Machu Picchu) will not have the chance to climb Huayna Picchu and see the site from this angle. For these people there are several different alternatives that will also give you the chance to see Machu Picchu from above and even with lesser crowds. For more information about these alternatives, please click here.